I’m back from a blogging hiatus, and I’ve got a few sites to post about that I visited during a trip to Seattle earlier this year. The first is a unique little dog park on 6th Avenue, on Amazon’s campus but open to the public, tucked between a tall building and the company’s new “Spheres” near the downtown. Most leash-free sites that come to mind are the suburban variety with large fenced lawns – although this one is small, it’s a valuable amenity for those urban-dwelling canines who don’t have their own yards to roam. Dogs who live in the city are probably used to smaller, cramped quarters anyway, so they don’t need a lot of space to run around and socialize off-leash. 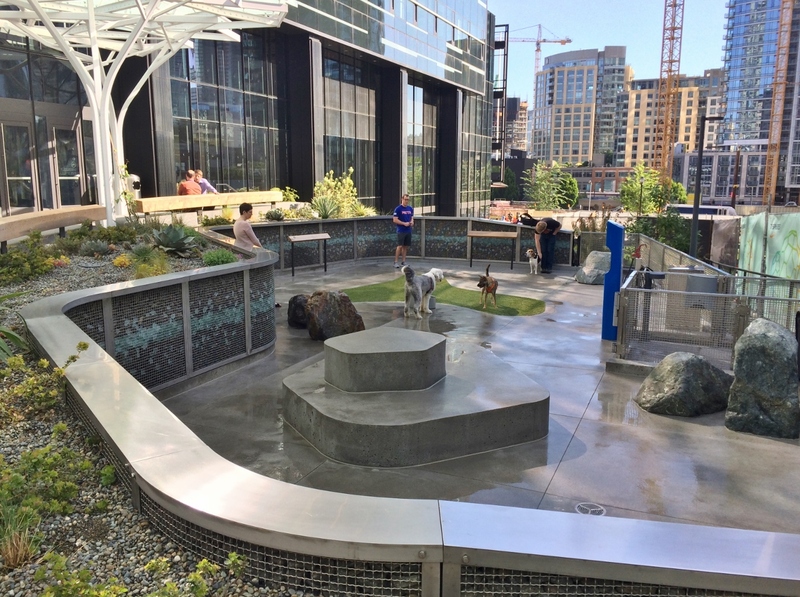 This little dog park is the best-looking one I’ve ever seen – although the dogs don’t care, their humans probably appreciate the pleasant features of this space. Instead of being separated from the street and other areas with fencing, the designers took advantage of the grade change of the site and included a retaining wall which works very well as a barrier. This wall is an attractive metal gabion which includes a carefully-placed line of aqua-colored glass stones along the center. The park also contains a little patch of lawn (artificial, I’m assuming); rocks (for peeing? ); a dog-height drinking fountain; and a multi-level platform (perhaps so the pups can play “king of the hill”). And, of course, there’s the requisite doggy poop bag station. The whole park looks like it’s regularly washed down to keep things clean. I rate this space as a win-win for both the dogs and their people.